The US navy is currently looking for a stronger naval pretense in Indian Ocean with the help of Indian Navy, US looks for the Andaman naval base to carryout operations against Chinese increasing naval activity in Indian ocean as well as Bay of Bengal, where Indian navy short on legs to confront the Chinese violations in Indian waters. US will support the Indians by providing real time imaginary of Chinese naval ship movements to Indian navy to confront. 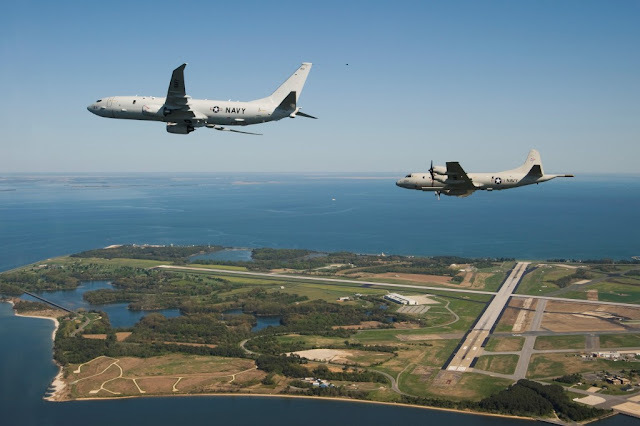 US may fly the modern MQ 4C BAMS along with the Indian navy P 8I for long endurance surveillance. India almost close to sign the military logistics supply agreement with the Americans, which can support each others military operations, also include humanitarian and disaster relief, with the logistics agreements US and India both works together to solve issues related to both nations. The modified LSA agreements specially focus the Chinese aggression near Indian borders. After breaking the decade old ideology of non alignment, The new government taken better steps to counter the Chinese influence in Indian sub continent, which include revamping all stalled construction near Chinese border. where China forced the Indian government to freeze all construction works close to borders. This include a bridge construction near Ladakh, more number of ITBP outpost construction, allowing US search and rescue team to search for the mortal remains of B 24 bomber crashed near Arunachal, these all plans are forced to freeze due to the Chinese influence. Even more China irked the Indian navy by sending warships and nuclear submarines inside Indian waters in Andaman. where Indian navy short on legs to confront the Chinese ships. The new government taken some good steps, revamping all constructions close to border, establishing naval bases and re innovating the abandoned air fields close to the Chinese border, even more teaming with the US to counter Chinese influence. US navy admirals once expressed about the interest of using Andaman islands to operate the Navy's MQ 4C Triton maritime surveillance drone. The same drone which is offered to Indian navy and still on consideration. with the use of this base, US Navy can monitor the movement of Chinese ships and submarines in Indian ocean and Bay of Bengal through Malacca strait. Malacca strait is the narrow way which can be used by the Chinese to enter Indian waters, When war erupts between China and India, China try to breach Indian waters through that way. To counter the Chinese navy India almost beefed up the security of Andaman, by deploying modern warships missile boats and patrol ships. Even during the Exercise Malabar both nations stimulated ASW warfare using submarines and P 8I aircraft in bay of Bengal to Malacca strait, which irked the Chinese way too much. Not only that India finding all measures to counter China, with the south China sea issue in far other side, issues near LAC. All these makes China think twice before doing any misadventures against any nations nearby. More than twenty of landing strips near to the Chinese borders established by the IAF is NATO standard, which means all NATO military aircraft's can operate from that air strips. Where China tries to pin down Indian air force by engaging with only ground troops. where the territories gives upper edge to the Chinese forces. US look of Andaman is for only one mission, to work with the Indian navy to stop or confront the Chinese ships sailing repeatedly over Indian Ocean and Bay of Bengal, where Indian navy short on legs to confront them, Indian Navy alone tried the same, due to lower number of ships and equipment Chinese ships easily bypass Indian warnings. For temporary base deployment US and India must sign another military contract, what exactly is allowing US forces in India. the contract named EDCA. However India doesn't seems to sign. So US may provide clear picture of Chinese naval activity's near IOR if Indian navy asks.